What one thing should I focus on when buying? Reader Question: Monty, I am a first time homebuyer. I have been saving for several years and have a good down payment, but I am in no hurry. I like your column, but there are so many topics to consider. Is there is one single subject that I could focus on to simplify the home buying process? Thanks! Justin B.
Monty’s Answer: This is a great question, Justin. The most important, yet least understood element of buying a home is drilling down on the value of it. While there are many considerations in the real estate process, detailed knowledge associated with valuing each property is the key. From a valuation point of view, understanding what components are serious and practicing the skill of identifying them as you view homes will leverage your understanding, your confidence and your buying power. Here are three exercises to practice that will demystify home buying. 1. The accuracy of facts of the property. One particularly common example of a practice that can obscure value is the measurement of square footage. If a home has 800 square feet of space in the basement that cost $15 a square foot, should that space be included in the overall usable square footage of the home upstairs that cost $100 per square foot? In most cases the answer is “no”, so check how the square footage total was calculated. 2. The property selected as a “comparable” sale. Are they truly comparable if they are similar square footage, but different styles? It is like comparing apples and oranges. A ranch style home costs much more to build than a 2 story home of the same size and quality on a similarly priced lot. Understanding this fact when choosing a comparable sale can affect the outcome of the analysis, so be careful to check the comparable sale’s style and do not accept them as a comparable if they are not. 3. 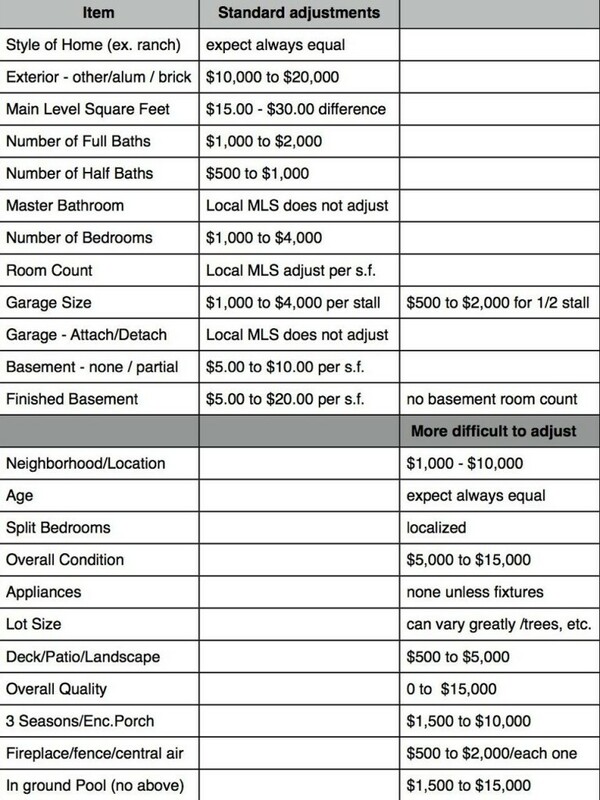 The value assigned to each adjustment between differences in the home’s features and the comparable home’s features. Making these judgments on the differences in value on 7 or 8 factors between properties can add up to a significant dollar amount. The image below illustrates the key features to focus on in evaluating a home. This is a much-improved strategy than depending solely on an agent or an appraiser to provide an opinion of value. While appraisers understand and must practice these steps, many real estate agents do not. Often, the information must be extrapolated from data sheets or can be judged best with your own eyes. This is a reason to collect MLS data sheets and make notes on them. Learning to evaluate a home by focusing on these three points can pay substantial dividends. The other value of understanding these elementary principles is more confident negotiations and logic in your pricing decisions. It positions the preservation of your hard earned capital by minimizing the risk of overspending. As a seller, it minimizes the risk of giving away a piece of your equity. On a cautionary note, there is a quirk to watch out for. What can happen with a home purchase is we get caught up with emotions. The effect of this phenomenon is it can overpower the reasoning skills discussed above. We can miss or dismiss relevant considerations over illogical emotions. As a common example, you want to live near a friend, so you limit your search parameters. This seemingly innocuous decision reduced your choices. The effect is that a superior property may be excluded, but 6 months after you buy, the friend moves away with a new job. It pays to think through your priorities carefully. Good luck with mastering this advice, Justin, if there are additional questions, please ask me.